Their symbol is a single blue eye that most likely represents their knowledge of the world. 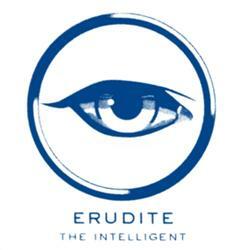 Erudite’s leader is Jeanine Matthews, proven to be the smartest member of the faction based on her IQ level. Traits: Chat about books and newspapers; in constant pursuit of knowledge. Curiosity- it drives them to seek knowledge. Physical Traits: Each member must wear at least one article of blue clothing per day. Erudite’s main color is blue, as it is a “calming color that helps stimulate the brain”. Also, most faction members wear thick glasses to make them seem smarter. Function: The faction produces most of the city’s librarians, doctors, scientists, and teachers. They are responsible for keeping records of the city and the factions. All technological achievements that the factions benefit from came from Erudite minds, such as the advanced agrarian methods employed by the Amity and all of the simulation serums. ‘Ignorance’ is defined not as stupidity but as lack of knowledge. Lack of knowledge inevitably leads to lack of understanding. So that the individual better understands how the world operates. So that the individual’s study in other areas is supplemented. So that as many individuals as possible area prepared to enter the fields devoted to innovation and progress. Leaders must not be chosen based on charisma, popularity, or ease of communication, all of which are misleading and have little to do with the efficacy of a political leader. An objective standard must be used in order to determine who is best fit to lead. That standard will be an intelligence test, administered to all adults when the present leader reaches fifty-five or begins to decline is function in a demonstrable way. Those who, after rigorous studying, do not meet a minimum intelligence requirement will be exiled from the faction so they can be made useful. This is not an act of elitism but rather one of practicality: Those who are not intelligent enough to engage in the roles assigned to us—roles that require a considerable mental capacity—are better suited to menial work than to faction work. Menial work is required for the survival of society, and is therefore just as important as faction work. Information must always be made available to all faction members at all times. The withholding of information is punishable by reprimand, imprisonment, and, eventually, exile. Every question that can be answered must be answered or at least engaged. Illogical thought processes must be challenged when they arise. Wrong answers must be corrected. Correct answers must be affirmed. If an answer to a question is unclear, it must be put to debate. All debates require evidence. Any controversial thought or idea must be supplemented by evidence in order to reduce the potential for conflict. Intelligence must be used for the benefit, and not to the detriment, of society. Those who use intelligence for their own personal gain or to the detriment of others have not properly borne the responsibility of their gift, and are not welcome in our faction. It bears repeating: Intelligence is a gift, not a right. It must not be wielded not as a weapon but as a tool for the betterment of others.